What is a Motorized Treadmill? Posted on October 27, 2017 , in Treadmill. A treadmill is a popular way to keep fit and exercise in the comfort of your own home. There are two different types of treadmills, motorized and non-motorized. There are quite a few differences between the two, including workout impact, features, and cost. In the article below, we will explain what a motorized treadmill is and how it is different from a non-motorized version. Also commonly referred to as a manual treadmill, the motion of your feet against the treadmill’s deck it what powers it. Unless you are moving, the belt will not budge. These are budget friendly models that will not have features such as incline, adjustable speed or customized workout programs. Some manual treadmills do come with consoles that are battery powered which will display the details of your workout such as distance, number of calories burned, speed and even pulse sensors. No Electricity – These can be used anywhere as they do not require power. If you are seeking a machine that you can take outdoors on a sunny day, don’t have an outlet nearby your machine or just want to reduce your energy costs, manual treadmills are the perfect option. Great Workout – Manual treadmills are entirely powered by you and your muscles, which make them a great way to work your lower body. 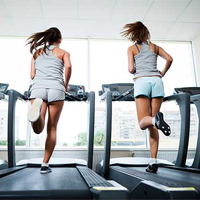 Safety – Since when you stop running, the machine will stop as well, manual treadmills are safe and do not require users to wear a safety strap in case they slip or fall. The motor sets the belt in motion on these treadmills, which can be beneficial as it does not cause any strain to start the machine. Motorized treadmills offer way more flexibility for workout programs as the incline and speed can both be adjusted while in use. Even with economic models, their consoles contain a variety of features including Bluetooth capability, app syncing, customized workout programs and even simulations of marathons and different exterior terrains. Manual treadmills are the cheapest option and can be found for under a few hundred dollars. Motorized treadmills can start at several hundred dollars and a high-end, quality model can run several thousand dollars. If budget is a major factor, it can be better to purchase a manual treadmill versus a cheap motorized model as they have inferior parts, can break easily and require costly repairs. However, for those looking to get the most out of their daily workout, a high-end motorized treadmill will provide both variety and value. There is more impact on the knees and hips with a manual treadmill as the workout is more strenuous on the body. Joints are more subject to strain or injury as there is no cushioning system on the belt. It can also be more difficult to sustain a consistent pace which can affect your heart rate level as well as how long you can exercise for without becoming fatigued. Motorized treadmills are designed to reduce the impact on the joints as well as offer a wide range of speed and incline options designed to maximize workout efficiency. The consoles of most motorized treadmills also include a feature called Heart Rate Control, which can control speed and intensity of the treadmill to match your desired target heart rate. Now that you know how a motorized treadmill is different from a manual one, download this month’s promotions to save and find the perfect model for your lifestyle.